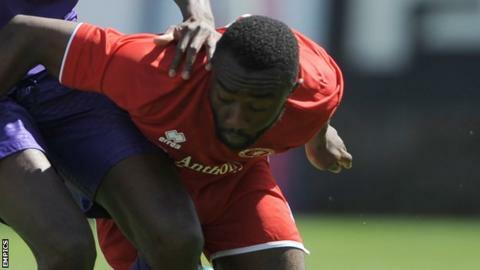 Guiseley's first-ever game in the top tier of non-league football ended in defeat at Welling United. Zac Thompson pulled a decent effort wide for the visitors early on before Sahr Kabba got what was the winner. Kevin Lokko headed a cross back across goal and Kabba reacted quickest to tap the ball home. Michael Chambers could have doubled Welling's lead before the break, but he headed over from point-blank range, and was denied again 11 minutes from time. Match ends, Welling United 1, Guiseley 0. Second Half ends, Welling United 1, Guiseley 0. Substitution, Welling United. Kojo Awotwi replaces Loui Fazackerley because of an injury. Ryan Toulson (Guiseley) is shown the yellow card for a bad foul. Afolabi Obafemi (Welling United) wins a free kick. Attempt missed. Liam Dickinson (Guiseley) right footed shot from the right side of the box misses to the left. Attempt saved. Michael Chambers (Welling United) header from the centre of the box is saved. Assisted by Ricky Wellard. Substitution, Welling United. Afolabi Obafemi replaces Tashan Adeyinka. Substitution, Guiseley. Gavin Rothery replaces Will Hatfield. Attempt missed. Adam Boyes (Guiseley) left footed shot from the centre of the box misses to the right. Substitution, Guiseley. Liam Dickinson replaces Nicky Boshell. Offside, Welling United. Tashan Adeyinka tries a through ball, but Tashan Adeyinka is caught offside. Attempt saved. Tashan Adeyinka (Welling United) right footed shot from outside the box is saved. Substitution, Welling United. George Porter replaces Sahr Kabba because of an injury. Tashan Adeyinka (Welling United) wins a free kick. Tashan Adeyinka (Welling United) is shown the yellow card for a bad foul. Foul by Tashan Adeyinka (Welling United). Attempt missed. Tashan Adeyinka (Welling United) right footed shot from outside the box is too high. Offside, Guiseley. Robert Atkinson tries a through ball, but Robert Atkinson is caught offside. Second Half begins Welling United 1, Guiseley 0. First Half ends, Welling United 1, Guiseley 0. Attempt missed. Michael Chambers (Welling United) header from a difficult angle on the left is too high. Assisted by Ricky Wellard with a cross.